Al Pryor is a serial social entrepreneur – one whose ideas are designed to change the world. First experiencing success with his creation of the Compact Shelter, a foldable crisis relief shelter for disaster victims and the housing displaced, Al then went on to found Aussietanks, a company specialising in collapsible and portable water tanks that store water for dry spells in Australia. He is now working on his latest project, Totes Making A Diff, a social enterprise that enlists local designers to print tote bags, where 50% of profits go to the Artful Dodgers studio in Melbourne. With the intention to positively impact as many people as possible with his ventures, Al combines his innate entrepreneurial skills with his appetite for altruism – an incredibly effective combination when pulled off. 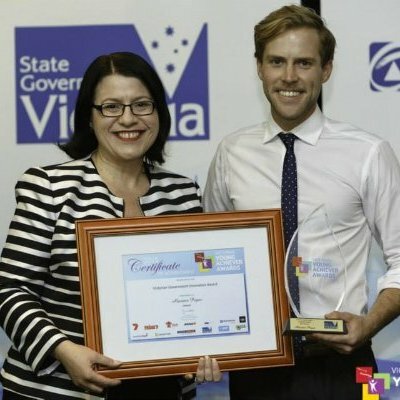 You saw some incredible successes with your first venture Compact Shelter, including winning the Victoria Young Achiever’s Award for Innovation. Did the Compact Shelter act as a springboard to start your other ventures such as Aussietanks, or were they all unrelated? The Compact Shelter was definitely the springboard for my other ventures in several ways; from building a passion for developing innovative products, to having the opportunity to raise more capital with a few wins already on the board. It’s definitely important to gain knowledge quickly, failing fast, and then adapting your methods to hone success. This usually comes from developing an established venture first; you apply what you learnt onto the next one, and hope you don’t fall into the same mistakes again. What measurable successes have you seen to date from the Compact Shelters and Aussietanks? Compact Shelters has turned in to more of an R&D factory. We have been receiving innovation grants from Oxfam Great Britain, and as a result have developed three shelters that have been influential in the development of using alternative materials for shelters and aid. We worked heavily in sourcing aid relief items such as tarps, sleeping mats and sanitary items in major disasters as the Philippines typhoons in 2013. Aussietanks, which was formerly known as Handytanks, was built with the intention of being stocked in every major hardware retailer in Australia and America with the likes of Costco, Walmart, Bunnings and Mitre 10. Most people don’t enter social enterprise for the money. What’s your biggest motivator for developing these products? It’s really quite simple. I love business and I love helping people. Innovative products really do blow my mind; it’s what makes me tick. Some of the greatest inventions in the world have been the simplest. Your latest venture, Totes Making A Difference, is a little different to your past enterprises. What was the impetus for starting this, and how do you hope to see it grow? My motivation for Totes Making A Difference actually stemmed from a bout of depression. As I came out of a 24-month ordeal I felt that it would be great to create a social enterprise centred around the awareness of issues young people can relate to, that being alcohol and drug addiction, and mental illness. Totes Making A Difference is an outlet for me to spark a conversation about this. Did you have an existing relationship with the Artful Dodgers before you began Totes? No I didn’t, it took me roughly around three months to find a charity that I thought was in line with we were looking for, that being a grassroots, small, art based charity. We now call our partnership with Artful Dodgers Studio a "match made in heaven". Your enterprises don’t just affect one person or one charity; they seem to have an impact on a lot of different people – i.e. Totes is not only helping the Artful Dodgers but is enlisting young designers to help make the bags. Is this intentional – do you want to have a positive on as many people as possible? Of course. The greatest thing about technology is we have the opportunity to connect to a global audience. Totes Making A Difference is online only, with a focus on using locally sourced manufacturers and screen printers. We have connected with illustrators from South Africa to Japan, all over the world. It turns out that the Internet is a handy resource for finding designers! How do you plan on marketing and spreading the word for Totes? Initially through a cross-promotion with our engaged artist on social media, then once we have enough traction source alternative methods like Facebook advertising and banner ads. We’ll ultimately have a heavy focus on digital marketing. Do you think entrepreneurship can be taught, or is something that’s innate? That’s always a good question and something that is highly debated amongst entrepreneurs. I believe there are common traits and attributes amongst entrepreneurs that enable success, but whether these can be taught is another thing. I come from a family of self-employed individuals, and we have always led for ourselves. My passion for business was sparked at an early age! What’s your advice for young entrepreneurs looking to develop their own social enterprises? Social enterprises can really be any form of business with a social conscious – there’s no specific model. I believe that our generation has realised greed and power aren’t everything everything, and giving back has more of a lasting impact. I try to adopt the “David vs Goliath” mentality – I find it helps!